Due to an accurate launch and propulsive maneuvers that consumed less fuel than expected, the LADEE mission will continue to make important discoveries about the moon’s atmosphere and dust environment. NASA has approved a 28-day mission extension for the Lunar Atmosphere and Dust Environment Explorer (LADEE). 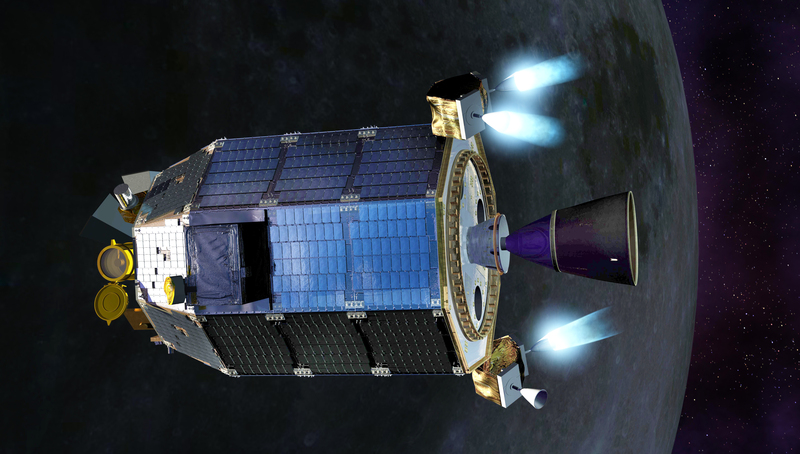 LASP provided the Lunar Dust Experiment (LDEX) onboard the satellite, which launched on September 6, 2013, and is now expected to impact the surface of the moon in late April 2014. Due to accurate and efficient propulsion and guidance over the course of the mission to date, the spacecraft has more fuel remaining than mission operators originally expected. The extra propellant will provide an opportunity for LADEE to gather an additional full lunar cycle worth of very low-altitude data to help scientists unravel the mysteries of the moon’s tenuous atmosphere and dust environment. During the extension, the orbit of LADEE will be lowered from a closest approach of between 12 and 30 miles to within a few miles above the surface, where the team hopes to observe changes in particle density and size distribution. LASP planetary scientist Mihály Horányi, a CU-Boulder physics professor and LDEX principal investigator, anticipates exciting new results from the mission extension. “LDEX measurements already identified the high-altitude dust exosphere. The upcoming low-altitude orbits are especially exciting for us, as we expect a dramatic increase in the number of dust impacts LDEX will observe,” said Horányi. LDEX is an impact ionization dust detector that has measured the dust tossed up by regular meteoroid impacts on the lunar surface and occasionally sees an increase in dust due to meteoroid showers, such as the Geminids in December, and “dust bursts” that may be due to LADEE flying through impact plumes. Detailed information about the structure and composition of the thin lunar atmosphere and dust environment will help scientists address enduring unknowns about our closest celestial neighbor and understand other bodies in the solar system, such as large asteroids, Mercury, and the moons of outer planets. The final maneuvers of the spacecraft are expected to consume all of its available propellant. To learn more about LADEE and the LDEX instrument, visit http://lasp.colorado.edu/home/missions-projects/quick-facts-ladee.